Have you ever wanted to have an Activity or Loading indicator dialog screen overlay, that is transparent, and fully customized by you? in your Xamarin.Forms project? Then you stopped at the right place. So I’m going to revert your attention to the previous blog post I wrote, Build your own Transparent Page from scratch for Xamarin.Forms, which was all about creating a Transparent page for Xamarin.Forms using a bit of native code. And I’ll be using the same concept and the code here as well, but I’m not going to drill down to the technical details of that specific implementation here, so if you’re looking for it, go ahead and give it a read first and come back. So to do this, we’re going to implement a native Transparent page in our Platform projects (iOS and Android), then we’re going to create a Service implementation that can display and dismiss our Transparent pages on demand while being able to pass in the desired Content View as we wish to display as parameters. The actual concrete implementation of that service will bed laid down in platform specific projects, along side the native Transparent page rendering implementation. So that we can do the rendering or displaying or dismissing our Loading/Activity indicator overlay on demand as we wish. Alright then let’s hit it with the Service interface implementation. Let’s call it ILodingPageService. So we will have three interface methods, one to initiate and prepare the Transparent page we’re going to display as our Loading/Activity indicator overlay. Then two more to Show it or Hide it on the app. Speaking of InitLoadingPage() method, the reason we need is to facilitate the feature of displaying different Loading pages or designs on demand at the run time. So let’s say in Page 1 we want to display one Loading page, then in Page 2 we want to display a different kind of Loading Page, that right there is possible here with this method. You just pass in whatever the Loading Page design you want to show, and you’re done! 😉 How cool is that! Here come the actual magic, let me begin with Android! So let’s start off with our ILoadingPageService’s concrete implementation for Android and register it with the Xamarin Dependency Service. 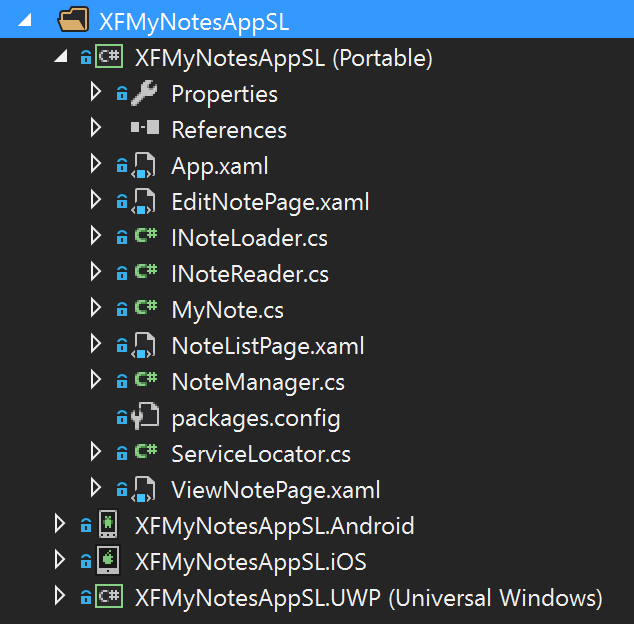 Most of the above Xamarin Android specific code is already explained in detailed line by line in my previous post. 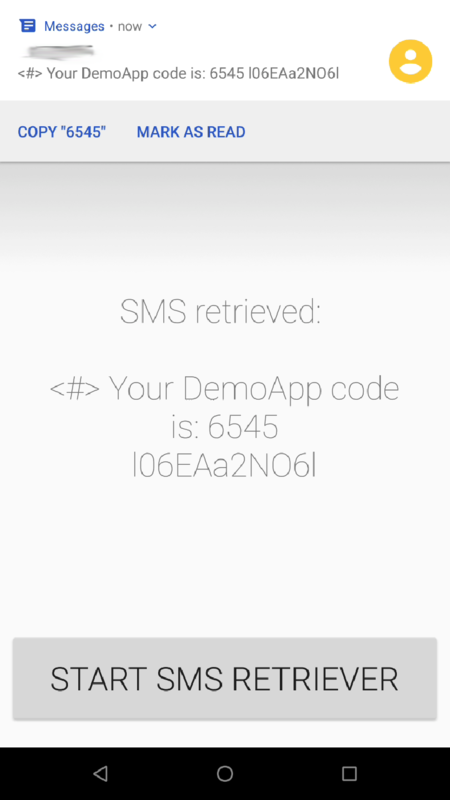 So in short, here we have the concrete implementation of our service for Android, inside the InitLoadingPage() we’re passing in the Xamarin.Forms Page which we want to render as a transparent page which will act as our Activity Indicator. Then we’re rendering that page and embed into a Android Dialog view with a transparent background, and back button cancelled properties enabled. We’re keeping a reference of the _dialog instance so that we can show or hide the Page upon respective ShowLoadingPage() and HideLoadingPage() executions. So every time a user wants to display a different Loading page, they will call the InitLoadingPage() which will build the new page instance and keep it in the service memory. At the same time you may have seen inside ShowLoadingPage() if you haven’t instantiated the transparent page, then we’re using a default page, LoadingIndicatorPage1 as a template ad instantiating it on the go, just to avoid exceptions. This choice of default page is totally up to you. Then let’s move on with our ILoadingPageService’s concrete implementation for iOS and register it with the Xamarin Dependency Service. So the implementation here is also similar to Android code above, except for the native bit. So we’re instantiating the Xamarin.Forms Page instance inside, InitLoadingPage() method we’re initiating the transparent page instance and holding inside the service. Then showing it or hiding it based on the ShowLoadingPage() or HideLoadingPage() calls. So to fire this up we need to call this service from your Xamarin.Forms code using the DependencyService. There we’re first initiating our page and then show it on the app. Once you initiate the page you don’t have to call it ever again as you saw in the implementation, it is retained in the memory of the service. Once you’re done, you can close our awesome Activity / Loading Indicator Page with the above code. The reason why it acts so independently is because we are directly accessing the native elements in the service implementation, therefore even during navigation of Xamarin.Forms Stack or whatever the UI activity our Loading page will not be affected, it will keep on, of its own. Now your own imagination is the limit for what’s possible or not fellas! There was this one time I wanted to build my own Transparent Page in Xamarin Forms, from scratch, all by myself, due to my ego and to challenge myself. But for real there was one instance I couldn’t use any 3rd party library for the project and all the code bits should be from scratch. So I had no option but to resort myself to creating my own Transparent Page in that Xamarin.Forms project. So this how it would look like. And limit of the expansion is all up to your imagination and developer skills. So to create a transparent page in Xamarin.Forms out of the box is impossible, which I’m not going to explain in detail. Obviously in short, for reasons such as Xamarin.Forms abstracts the most common subset of properties of the native platforms, we don’t have much power of customization of the UI. There is no way to use Xamarin.Forms ContentPage with transparency. (Yes I have tried!) So we need something beyond Xamarin.Forms stuff, Aha! Natively Rendered View, that could overlay on top of a give ContentPage. Also since we’re drilling down in the native levels, we have absolute control over Xamarin.Forms Pages, including the power to push any View on top of Xamarin.Forms ContentPage Navigation stack. So to do this we need to have some Native platform level access, so if you’re using a Xamarin.Forms shared project, this should be pretty easy, but for PCL projects, you may have to create a dependency service implementation to invoke this implementation. So in Android, we’re going to use Dialog View to implement the transparent Page and with the access of the Activity instance, we’ll push it to over any give ContentPage of Xamarin.Forms. Then in iOS, we’ll be using UIApplication instance’s KeyWindow property to push the transparent Page over any given ContentPage of Xamarin.Forms. Alright since this a Xamarin.Forms Transparent Page, let’s first create our usual ContentPage, with usual stuff. So like we discussed before, on Android we’re going to make use of the Android Dialog View to populate our transparent page. In order to do this we need to get access to the current Activity of our Xamarin.Forms Android run time. In order to do that we’re going to use CrossCurrentActivity plugin by James Montemagno. 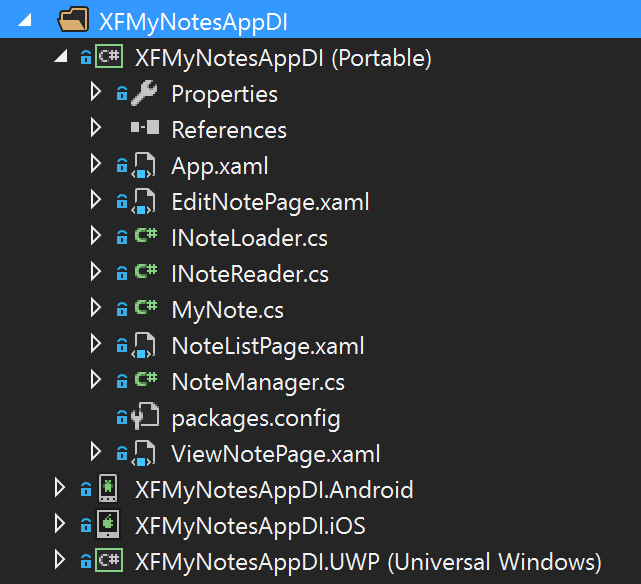 So before we begin, go ahead and add that plug in to your Xamarin.Forms solution using Nuget. There you have the magical code 😉 lol. You can see how we’re setting the Parent hook to our Xamarin.Forms page instance, then running the Layout() rendering circle allowing the Views to be actually measured and rendered in the memory. Then we convert our Xamarin.Forms page instance into a native Android View using the GetOrCreateRenderer() extension method which I will describe next. Then as I discussed before we’re attaching the native View into a Dialog View and setting it visible resulting in total awesome transparency of a page, along with the exact Xamarin.Forms content we wanted to display. As you can see it’s a simple implementation that takes in the Xamarin.Forms View instance and retrieve the native renderer for that View. Now when you need to hide the above Transparent page, you simply call Hide() on the Android Dialog instance. Then we go to the iOS stuff.. Here we’ve come to the iOS implementation, so just like we discussed in the beginning, we’re going to access the global UIApplication singleton to push our transparent page the application view through the KeyWindow property. So in a nutshell iOS renders every native View with the transparency give the proper background spacing, so we don’t really have to worry about using any placeholder view. The idea here is to get our Xamarin.Forms Page instance, run its Layout rendering cycle, convert that instance to an iOS native View. Then finally push it to the KeyWindow property by adding as a SubView. But in the context of iOS, you can see we’re getting the iOS native UIView of our Xamarin.Forms ContentPage instance and pushing it directly to the Application UI, by calling AddSubView() on KeyWindow property. Now when you want to hide the above created Transparent Page, then you simple call the RemoveFromSuperview() on our iOS UIView instance, which will result in it removing itself from UIWindow. How about Xamarin.Forms to Xamarin Native bridge? Now you might ask how am I going to bridge the above explained Xamarin.Forms and Xamarin Native implementation counterparts together? Now that’s some easy peasy nibbles I’m gonna leave up to your creativity or requirement. There’s many ways to call back and forth between Xamarin.Forms or Xamarin Native project levels, or in other words, between the PCL project and the Platform Specific projects. For starters, you could use Xamarin Dependency Service to register a service interface and concrete implementation to communicate between these two layers back and forth. 😉 And many other possibilities, so your creativity is the limit. Well frankly, that’s it fellas. But you may have noticed a slight issue in the Flip Animation, specially on Android and iOS as well (slightly though), where Flip animation moves the View out of it’s bounds. If you look closely, during the flip rotation, the View sort of scales up itself and moves out of the bounds of itself and scales back and revert back to the normal bounds. As of Android, the reason why the View scales out of bounds during the flip animation is because that is the default behavior of Flip Animation in Android. Since Xamarin.Forms Aniamtions binds to the native default behavior you could definitely expect it to behave that way. There’s an aspect called Camera View distance perspective for any given view, by default during any animation the Camera View aspect doesn’t change, thus causing the overblown effect of the Flip Animation. Here for the iOS its not much of an issue, but you do see a bit of the View scaling out of the boundary. So let’s dive into the iOS native flip animation. Let’s get started off with the subclassed custom control, naming it XNFlipView and the implementation is actually same as our previous XFFlipView control implementation, but the only difference is there’s no Xamarin.Forms Animation implementation, or handling of the IsFlipped property in the PCL code, since it will be handled in the Renderer level. Alright then let’s go ahead and create the XNFlipViewRenderer extending from ViewRenderer, as of Xamarin.Forms 2.5 and later we have to pass the Context in the Custom Renderer’s constructor, so let’s begin with that. Now as you can see above in the constructor we’re initializing the ObjectAnimator objects _animateYAxis0To90 and _animateYAxis90To180 which will be executing the native Flip Animation. Then in the Renderer’s OnElementChanged we’re calculating the Camera distance value to be used during the Animations execution as we explained before in the concept. Also you can see how we’re listening to the XNFlipView.IsFlipped value change and executing Animations. You can also change the speed of the animation by changing the SetDuration() parameters, which currently I’ve set to 1 second. So here in iOS Renderer, it seems a bit straight forward as we’re simply listening to the IsFlipped property change and directly executing the animation. So that’s basically the animation implementation code, which I have extracted from the given gist link at the top, which I have explained in the concept description as well. You can change the speed of the flip animation by changing the duration. So now to execute the awesome Flip Animation, simply change the value of the IsFlipped as follows. As you can see in code behind, we’re changing the value of the control’s IsFlipped property, Simples eh! 😀 This is fully bindable as well, so you can directly bind this to a ViewModel property as well. Let’s talk about how to properly handle advanced cross platform architectural implementations in Xamarin Forms projects, specifically when you’re abstracting native services/implementations in your shared code base, while trying to maintain loosely-coupled and scalable architecture. Now we all know how Xamarin Forms allows us to build cross platform mobile apps while sharing almost up to 100% of our code base and skill having native performance and look and feels. It does this by adding a common layer of abstraction which shares properties and behaviors which are common for the native platforms. Despite the incredible architecture of the Framework, one of the main drawbacks of it is that we do not get access to 100% of the native properties and behaviors, thus we only get the “common subset” of behaviors of each native platform that are shareable in a common manner among all the platforms through Xamarin Forms. So when we need to access some properties, behaviors or services that’s not available from Xamarin Forms layer, we need to drill down to the native platform specific level of that certain platform. Now for UI Controls and their properties or behaviors we could use Custom Renderes or Effects. But how about inbuilt native Services, such as Storage, Text-to-Speech, Location and so on? Turns out it’s all abstraction of an interface and mapping it to a platform specific concrete implementation, which could be described as the famous “Bridge Pattern”. Yes it does seem pretty simple but when it comes to actual practicality of it, then it becomes a little bit complicated or rather messy, unless you follow a proper implementation pattern. And it only gets more complicated when you keep on scaling your app project. Therefore it’s very crucial that we maintain a certain set of principal patterns when we do platform specific implementation with abstraction mapping. So we need to make sure that we maintain a proper set of principal patterns when deal with this situation as I explained earlier. Here I’m going to talk about three key principles to deal with advanced cross platform implementations for handling native abstractions. Now with the above principle patterns you could maintain a properly constructed and easily scalable Xamarin Forms project solution, when you’re dealing with advanced cross platform implementations with abstracting native services. Or rather any kind of an abstraction service implementation you could keep properly maintained by following the above patterns. The key advantage in all the above patterns are decoupled code, and scalability at any given time. Now keep in mind there’s actually many kinds of patterns you could follow in this scenario or you could come up with your own architectural patterns, but the above are known to be most used among Xamarin Forms projects. It is best to be aware of them, since you could either use them straight away or modify them according to your requirements. And keep in mind the above principle patterns could become slightly changed from their literal definition when it comes to actual implementation, it’s only the foundation concept that we need to keep in mind when we implement them, and make sure we are following the basics of it at least. There is no such thing as “the best” or “the worse”pattern for cross platform mobile development, it all depends on how you interpret it based on your requirements. The selection of which pattern or architecture suits best for you is totally up to you and your requirements, that is something very crucial to keep in mind. Therefore here in this post I shall be demonstrating each of the above patterns and how to implement them properly in a Xamarin Forms project solution for the same app concept. In order to properly demonstrate the above said patterns I will be implementing a simple Xamarin Forms app which allows you to writing notes, save them, view them, read them out loud, edit them, and also delete them. So in that case we will be using native Storage Services and Text-To-Speech Services of those native platforms, while having a shared code base. Alright now, I’m not going to get into spoon feeding details of how to do each native services implementation such as Storage and Text-To-Speech and implementing the XAML pages for the app and so on, but I will only be focusing on implementing the pattern for the given scenario, which is what matters for this post. So we are going to create a Xamarin Forms solution in Visual Studio, and keep the interface for the above native services in the PCL or Shared Project (INoteReader and INoteLoader) and have the concrete implementations of them to be moved down to the native projects. 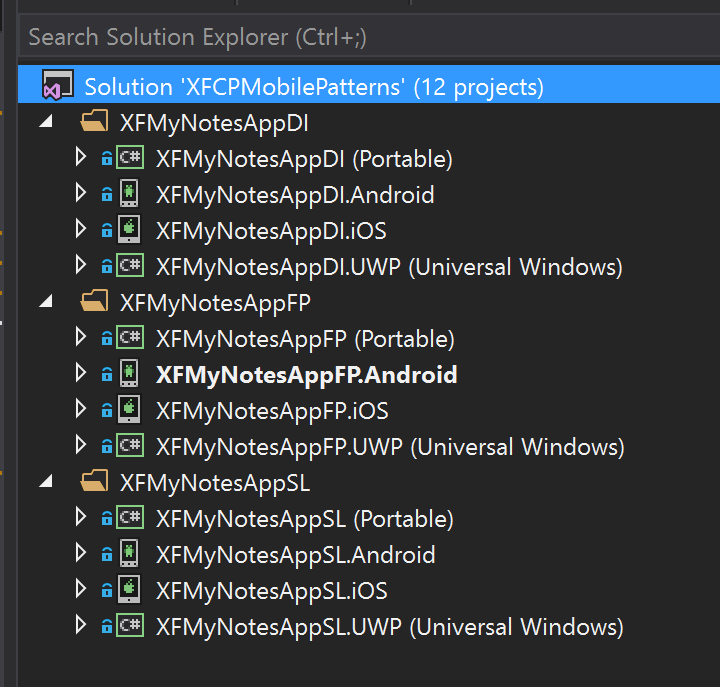 Then to demonstrate the differences of implementation of all the above three patterns I have created a complete solution (XFCPMobilePatterns) which has three sub folders, and included three Xamarin Forms projects in each of them which has the demo for Factory Pattern (XFMyNotesAppFP), Service Locator Pattern (XFMyNotesAppSL) and Dependency Injection w/ IoC (XFMyNotesAppDI). Oh yeah, back to basics yeah? the good old Factory Pattern, which allows you to create objects without exposing the creation logic to the client, or as in without having to aware of the concrete implementation. So for our implementation we are going to keep a static generic Factory which will handle mapping and creation of the services. And we would request the service by passing the service type. Alright next we are going to map our Service Interfaces (INoteReader and INoteLoader) which we have placed in the PCL project, with their actual concrete implementations in the platform specific projects using the ServiceLoaderFactory. Make sure to do this mapping in the run time execution point of each project as shown below. You can see there in the constructor, how we are loading the Service objects from our ServiceLoaderFactory and mapping them to the public interface instances, so that we could use them anywhere in our app. Now the reason why I’m maintaining the NoteLoader and NoteReader instances here is because with the Factory Pattern, every time we request a service instance, it creates a new instance of the service and returns to the client, which obviously is not efficient, that’s why I’m retaining those instances in the NoteManager class. But with few tweaks you could easily implement a Factory Pattern which caches instances, and reuse them upon request, but I wouldn’t waste time on that, since we could use Service Locator or Dependency Injection for such scenarios, which I would explain later in the article. Here’s how to access the above services in anywhere your PCL or Shared Project. As we already know, Service Locator Pattern, is all about locating a concrete implementation instance of an abstracted service interfaces at run time. This is something similar to Factory Pattern, but a different type of a solution for our situation, whereas it maintains a dictionary of registered services which has been mapped with their concrete implementation, which we can look up at run time and retrieve the instance. Now it is considered that Service Locator pattern is a variation of Inversion of Control principle, just as Dependency Injection pattern, which we’ll discuss in the next topic. This provides an on demand service look up at anywhere in the run time. The native service instances are stored in a dictionary-like data structure inside the Service Locator object, and returned at run time when they’re requested by the interface type. Obviously there will be a singleton static reference to the Service Locator object. There’s many Service Locator ready-made libraries out there, and heck even Xamarin Forms already provides a solid Service Locator in the framework, which you may have already heard of, Xamarin Dependency Service. So you could use it right out of the box in Xamarin Forms, for your abstracted service implementations. So let’s implement our own simple Service Locator, this was actually something I grabbed off of github. ///     this method will throw an InvalidCastException! As you can see how simple and straightforward it is. We maintain a singleton instance of the ServiceLocator, and there are the Add<TContract, TService>() which is used for registering the service interfaces with their concrete implementation and the Resolve<T>() which is used for retrieving the service instance at run time. Let’s add the above Service Locator to our project and construct it as below. And keep in mind the service implementation is going to be the same, having your service interfaces in the PCL shared project and the concrete implementations in the platform specific projects. Now with our Service Locator this is how you would register your Service Interfaces (INoteReader and INoteLoader) with their concrete implementations. As you can see, compared to the NoteManager we had in the Factory Pattern, this NoteManager is much more simplified and cleaner thanks to the ServiceLocator. This is because ServiceLocator allows us to maintain a single instance of our services such as INoteLoader and INoteReader, thereby we do not have to worry about duplicating their instances, we could simply access them anywhere in our code. Here’s how to access the above services in anywhere your PCL or Shared Project, and notice how we are directly accessing the service instance unlike in Factory Pattern thanks to the ServiceLocator. There you have it, now this clearly shows how easy it is to add more and more platform dependent services and use them in your shared code as you go on scaling up the project solution, all thanks to Service Locator Pattern! 😉 Altogether while simplifying the shared code compared to the Factory Pattern. Now this right here is like the holy grail or the most praised and most used pattern in our scenario. Dependency Injection is all about injecting dependencies to create a given object just as said by its name. This is all about automatically resolving the required dependencies at run time without having the client specifically looking it up and creating them and injecting them to the new object to be created. So we are delegating the whole dependency resolving to an automated mechanism, thus a very popular form of Inversion of Control principle, whereas a massive improvement over the Service Locator. Service Locator is good enough, only for smaller scale projects, where as you register services manually and look them up on demand at run time. But when the project gets more bigger and complex, with a lot of inter-connecting service and dependencies, it is very hard to keep a track on all of them, and most likely you’ll up missing a whole bunch of required dependencies in your code. This is usually a common case when you move into patterns such as MVVM implement for your mobile project, where you deliberately loosely couple all the layers of your app project, and you could easily end up missing dependencies. This is where Dependency Injection comes for the rescue, where as we inject the required dependencies in the constructor or as properties and delegate that whole process to an automated mechanism, which we call the “Container“. So whenever we implement a DI it always comes with a static singleton Container which manages all the dependencies and resolve them automatically at run time, and we just have to register the dependency mapping only with the container. Now there’s so many kinds of Dependency Injection Containers out there for you to choose from, given the popularity of this pattern. Unity, Ninject, AutoFac, TinyIoC and so on are some examples. It’s also pretty straight forward to roll out our own, but for this demo I would use an existing DI Container, Unity, quite a popular counterpart in this space. Alright then, first of all let’s add the Unity library to our solution. Make sure to select your PCL project and all the platform specific projects when you’re adding Unity from nuget. Let’s create a static reference for our container instance. Next here’s our NoteManager which is going to handle basic Note managing functions such as loading and saving notes. 🙂 You might see something different than what we had in Service Locator. As you can see we are passing in the INoteLoader and INoteReader services to the constructor of the NoteManager, this means that NoteManger cannot exist without those parameters services. 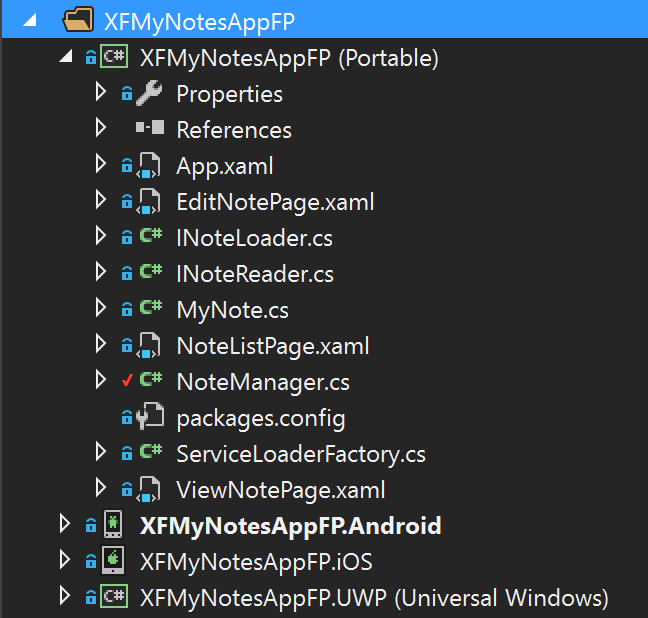 So what happens here is that, when we request an instance of the NoteManager, the IoC Container (Unity Container) will resolve those depending services instances and inject them into the NoteManager, whilst creating the NoteManager. Look how simple and clear the NoteManager is compared to our Service Locator and Factory Pattern principles. That’s how we are registering our NoteManager instance with the container, and we are instructing the container to retain a single instance of it by passing in the ContainerControlledLifetimeManager() type object to it. Also its good to keep in mind there are several object life time management types in Unity Container which you could play around with. One of the coolest things about IoC containers is that we could instruct it to how we need a certain object or a type should be managed in the run time of the app. 😉 Oh yeah, cool indeed! Now with our Unity Container this is how you would register your Service Interfaces (INoteReader and INoteLoader) with their concrete implementations on the platform specific level. Thanks to the IoC Container you could easily access the NoteManager anywhere in your code, which will give you access to the static retained instance. And of course the services as well. Specially you noticed how it simplifies our shared code compared to the Service Locator pattern. Also its worth it to notice, how using an IoC Container brings many useful features to the table that you could use to improve your code. So again, which one should I use? Each one of those patterns have their own advantages and disadvantages, yet you may have noted a general aspect improvement over each other such as Factory Pattern < Service Locator Pattern < Dependency Injection Pattern. Let’s break it down as below. So there you can clarify my claim of general improvements over each pattern, Factory Pattern < Service Locator Pattern < Dependency Injection Pattern. Although that’s being said, the choice of Pattern to follow is totally up to you and your requirements. As an example something like Factory Pattern or Service Locator Pattern would be good enough for a small scale projects and Dependency Injection would be perfect for large scale projects with heavy MVVM based apps which uses a lot of service dependencies and so on. So I hope my demonstration of each of the patterns and how to implement them properly in a Xamarin Forms project solution for the same app concept, may have helped you in deciding which patterns to be used in any given scenario, which uses cross-platform dependencies. A Keyboard disabled Entry control in Xamarin Forms? A Xamarin Forms Entry Control without a keyboard? So when the user clicks on the Entry, the keyboard wouldn’t pop up? Yep, that’s what I’m talking about yo! There was this one time where I was asked to implement a page which had an Entry with a bunch of custom buttons in the page, which would insert their specific values into the Entry controls when they’re clicked. You could say, use a Label control where you would append its text value upon the custom key button clicks. Then you might say use the Keyboard dismissal service which I posted last time in my blog, and call up on it every time the user clicks on the Entry? But nope, that would look extremely distracting while the keyboard keep on popping up and down when the User clicks on the Entry every time. Alright since we are going to customize our Entry control, we need to drill down to native levels of the actual Entry’s control rendering. The Android EditText control that associates with the Xamarin Forms Entry’s has a property called ShowSoftInputOnFocus property which allows you to disable Keyboard attachment behavior upon focus for the EditText. Then for iOS UITextField control that associates with the Xamarin Forms Entry’s has a property called InputView property which allows you to disable the Keyboard attachment by assigning it to an empty UIView object. First of all create a Custom Entry control by sub-classing it. Let’s call it SoftKeyboardDisabledEntry, just for the kicks of it 😉 ! Alright let’s drill down to iOS renderering of our custom control. Alright there we assign an empty UIView to the InputView property of the native control instance, which will replace Keyboard attachment at run time. Ok then comes the Android renderer, with a bit of work though. Here’s how to consume it in your XAML! <Label Text="Welcome to the Entry with disabled Keyboard!"